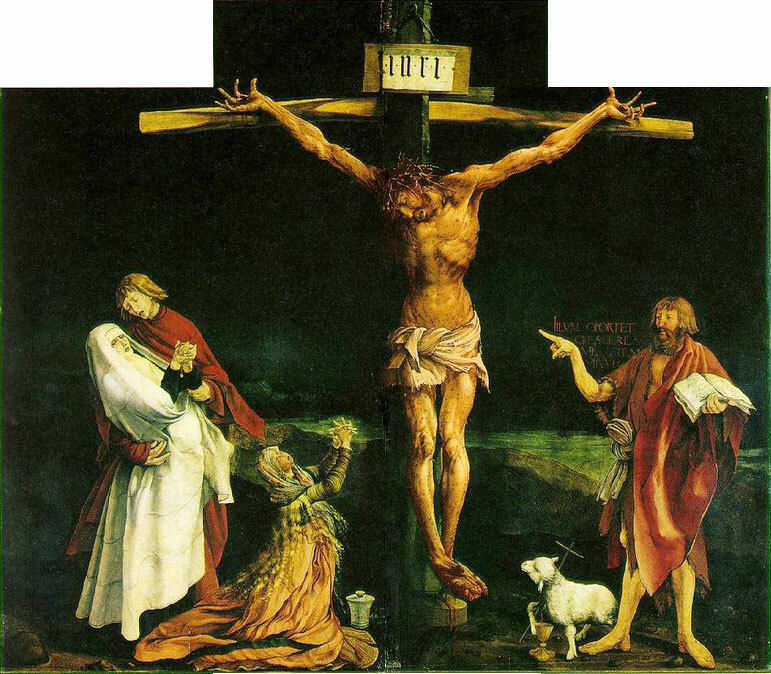 Grunewald's depiction of the Crucifixion. A Lebanese singer, Fairouz, sang this haunting elegy in a Beirut church in 1965. "Today, He was hung on a piece of wood, The Man who hung the world above water.... We kneel before your Passion, oh Christ. Almighty God, I ask you to graciously to bless this earthly family, for which our Lord Jesus Christ was content to be betrayed, and given up into the hands of wicked men, and to suffer death upon the cross. By His Spirit the whole body of the Church is governed and sanctified; Hear my prayers, which I offer to you for all conditions of people in your holy Church, that every member of it, in his vocation and ministry, may truly and faithfully serve you; through our Lord and Saviour Jesus Christ. O merciful God, who made all men, and hates nothing that you have made, nor desires the death of a sinner, but rather that he should be converted and live; Have mercy upon all who do not know you, as you are revealed in the Gospel of your Son. Take from them all ignorance, hardness of heart, and contempt of your Word; and so fetch them home, blessed Lord, to your fold, that they may be made one flock under one shepherd, Jesus Christ our Lord, who lives and reigns with you and the Holy Spirit, one God, world without end. Amen. Pilate took Jesus and had him flogged. The soldiers twisted together a crown of thorns and put it on his head. They clothed him in a purple robe and went up to him again and again, saying, "Hail, king of the Jews!" And they struck him in the face. When Pilate heard this, he brought Jesus out and sat down on the judge's seat at a place known as the Stone Pavement (which in Aramaic is Gabbatha). It was the day of Preparation of Passover Week, about the sixth hour. "Here is your king," Pilate said to the Jews. But they shouted, "Take him away! Take him away! Crucify him!" "Shall I crucify your king?" Pilate asked. "We have no king but Caesar," the chief priests answered. So the soldiers took charge of Jesus. Carrying his own cross, he went out to the place of the Skull (which in Aramaic is called Golgotha). Here they crucified him, and with him two others�one on each side and Jesus in the middle. Pilate had a notice prepared and fastened to the cross. It read: JESUS OF NAZARETH, THE KING OF THE JEWS. Many of the Jews read this sign, for the place where Jesus was crucified was near the city, and the sign was written in Aramaic, Latin and Greek. The chief priests of the Jews protested to Pilate, "Do not write 'The King of the Jews,' but that this man claimed to be king of the Jews." Pilate answered, "What I have written, I have written." "Let's not tear it," they said to one another. "Let's decide by lot who will get it." This happened that the scripture might be fulfilled which said, "They divided my garments among them and cast lots for my clothing." So this is what the soldiers did.